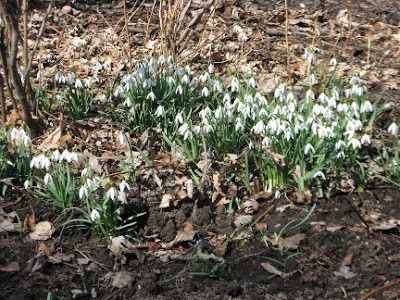 With temperatures hitting the mid and upper teens (Celsius) this week in Toronto, it seems like bulbs and buds (makes for a nice landscaping company name) are in overdrive to open. We had so little snow this winter that it doesn't feel like we even had one. Not a typical Toronto winter but no complaints here! These were taken at a client's shady backyard in the midst of a garden cleanup. I'm not the world's biggest fan of spring bulbs/corms but I would miss these little guys, along with crocus and grape hyacinth. When everything else is brown, they provide welcome colour with very little maintenance. Let the unfurling of the hellebores begin! Hellebores are getting ready too! Since my client wasn't home, I couldn't verify if this was Helleborus orientalis or x hybridus although I suppose it shouldn't matter. I cut away the diseased leaves from last year to expose the purplish emerging foliage and flowers. There are four clumps so this will be a nice show soon! I don't see barrenwort (Epimedium sp.) enough in other peoples' gardens so it's a treat to see them here. 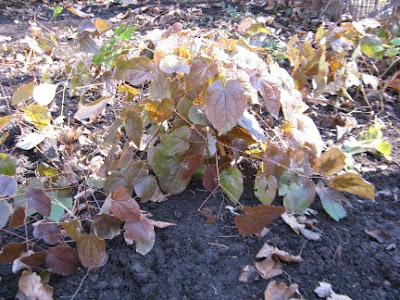 The leaves came through the winter without severe damage so I didn't prune them heavily. I poked around the base and saw buds protruding--a good sign for another successful Epimedium show. Fun/silly fact: This genus is also called "horny goat weed" or "rowdy lamb herb." Są przebiśniegi, jest piękna wiosna nareszcie :-). Pozdrawiam. 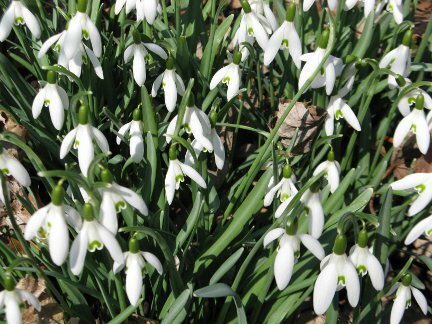 *** There are snowdrops, is a beautiful spring at last :-). Yours. yes, I feel that spring is here but there is a high chance for snow. Indeed, horny goat weed! I am reading where in China and Japan, large swathes of endemic Epimedium species are being harvested to the point of extinction for this supposed aphrodisiac! 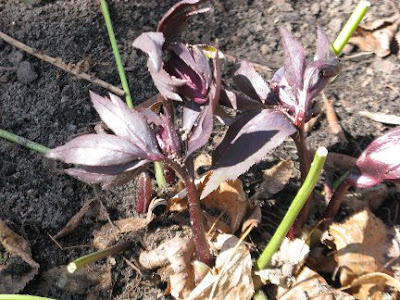 I too see new growth on the Helleborus, but I am going to wait a week or two as I think Old Man Winter still has something up his sleeve! It is a wonderful time of year when the Galanthus are all abloom..... all those demure white heads bent down. well, Barry, I'm Chinese and, at the risk of gross generalization, we tend to label anything an aphrodisiac. Several millenia of anecdotal evidence abounds, regardless of Western science, lol!